Priyanjoli is a Chennai based online label that draws inspiration from centuries of handloom tradition and works with clusters of rural weavers and artisans to create designs and textures. This online label is all about the beauty of handmade, hand loomed and hand-woven attire. They have pretty dresses, tops, skirts and scarves, all in ikat and unstitched fabric too. Expect to find traditional techniques working to make contemporary patterns and modern designs. The designer, Priyanjoli was born in Kolkata and studied fashion and design at the London College of Fashion. She now collaborates with master craftsmen to produce heritage textile with a fresh aesthetic. Her designs are inspired by the modern woman and the entire collection resonates deeply with her passion for the by-gone handloom tradition. The best part about the label is the fact that they offer personalised client services. Priyanjoli understands that not everything fits everybody the same way and hence gives you the option to send them your custom measurements while placing an order with them, which makes the experience a completely personalised one. This means that women of all sizes can wear a Priyanjoli creation. Yay for inclusivity! You can also select a ready-made design by taking a look at their size chart (from petite upto Size 16). They also offer a reverse pick up and alteration service, in case of any further alterations. The label strives to work with weavers and tailors from forgotten corners of India to help them find a place on the global fashion-map. 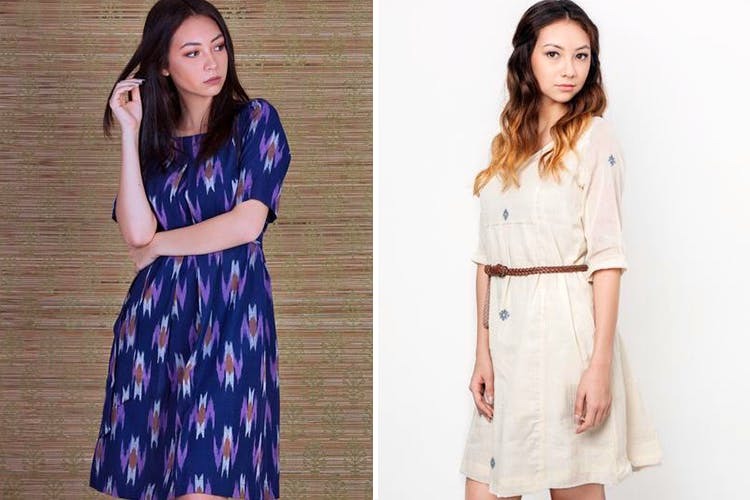 Though Priyanjoli does plenty of basics like casual tops, which are perfect to wear to work and some informal jackets, it is their ikat dresses collection that has caught our eye. Though the label is not definitely not budget, they do have an offer running where if you sign up now, you’d get a 10 percent discount and also have free shipping all over the country.